Vera and her brother Will live in the shadow of the Great Panic, in a country that has collapsed from environmental catastrophe. Water is hoarded by governments, rivers are dammed, and clouds are sucked from the sky. But then Vera befriends Kai, who seems to have limitless access to fresh water. When Kai suddenly disappears, Vera and Will set off on a dangerous journey in search of him-pursued by pirates, a paramilitary group, and greedy corporations. Why I want it:I’m a sucker for any kind of dystopian. And this one sounds great! However, am I the only one who noticed that the “cover” says “stockphoto” on it? What up with dat? 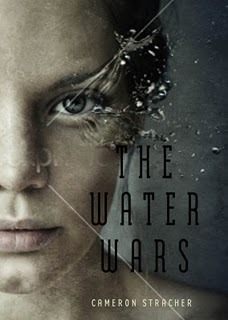 Do you want to read The Water Wars? I really want to read this book! I can't wait.